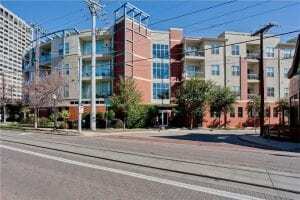 The Mercer Square Condos has 85 condo homes and is located in the premier Uptown neighborhood. These Condos are just steps from several restaurants, shops, and boutiques making it an ideal location to walk along McKinney Avenue or catch the Uptown Trolley. Mercer Condos feature stainless appliances in Kitchen, granite counters, high ceilings, gorgeous baths and much more. This private building has lobby access, elevators, controlled parking garage and a resort style pool.